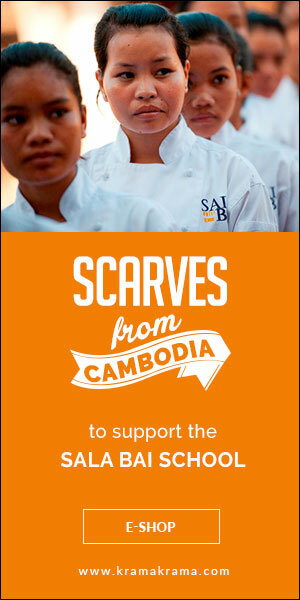 The NGO we work with for our Krama Krama scarves is based in Siem Reap, in north-west Cambodia. Below you will find the different attractions and activities on offer there. 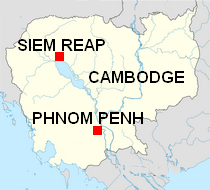 Siem Reap is capital of the Siam Reap province and has over 170,000 inhabitants. Arriving in Siem Reap you enter the majestic world of the Temples of Angkor. In Angkor Park, which means « capital » in Khmer, you can admire over 300 temples built between the 9th and the 14th centuries. Successive kings of Cambodia each wanted to leave a lasting impression by building spectacular monuments, and the Angkor site is symbolic of the golden age of the Khmers. Siem Reap and the Temples of Angkor are inseparable. Angkor is just 6 km north of the city which itself covers 400 km², so visitors should stay for several days, because it is really worth the visit. If time is limited, a one-day visit is possible : concentrate on the main buildings – the temples of Angkor Vat (the most famous), Bayon and Ta Prohm. If you have 3 days to visit the site, you can take the « small circuit » and visit the Bantey Srei, 25 km north of Siem Reap. Those lucky enough to have more time should explore the « grand circuit’ and leave the beaten track to discover some lesser known temples like the Pre Rup, a former funeral building from 961 that offers spectacular panoramic views. There are several ways to visit the Angkor site. By tuk-tuk, a kind of taxi-tricycle, you will be protected from the elements and motorised. However, tuk-tuks do not travel very fast, so it will be difficult to have do the grand tour. A car is also a good alternative, but the authentic and exotic side will be somewhat lost. Sporty visitors can discover the wonders of Angkor by bicycle. Other alternatives include visiting the site on horseback, by donkey or by quad. You should decide what means of locomotion best suits you, depending on the weather conditions and how much time you have. The city of Siem Reap has a number of restaurants and cheap places to eat. Food is also available on-site in Angkor, but remember that prices vary and can be based on the customer’s appearance, so tourists are liable to be charged higher prices. If the prices seem excessive, you can always haggle but be sure to remain polite and keep a smile on your face when negotiating. Finally, for a good night’s sleep, visit one of the many hotels and Guest Houses in Siem Reap. We recommend the Sala Baï school/hotel, where disadvantaged Cambodians learn hotel and restaurant trades. ← How to wear men’s scarves stylishly ?